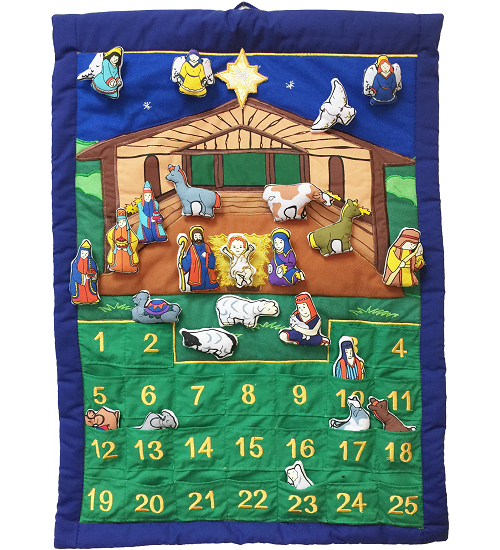 Nativity advent calendars create a wonderful family tradition for the Christmas countdown and you can bring the story of the Nativity to life with this beautiful soft sculpture (cloth) Nativity Manger advent calendar. Featuring the stable on the hillside under a starry sky, this reusable Nativity advent calendar includes 25 detailed, hand-sewn fabric ornaments for a fun, interactive Christmas countdown. These screen-printed (some with embroidery), puffy ornaments start out nestled in their pockets and then are placed around the manger scene (via Velcro) one day at a time to count down the days until Christmas. 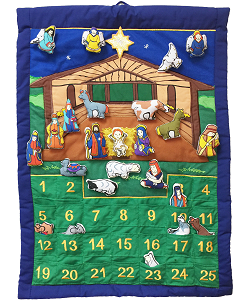 This cloth nativity manger advent calendar is keepsake quality and will be enjoyed for years to come. Note: This cloth Nativity advent calendar can be easily personalized at your local embroidery shop. The story of the Nativity comes to life in this beautiful hand-crafted Nativity advent calendar. Capture the spirit of Christmas with this beautiful hand-crafted Christmas Tree advent calendar which reflects classical Christmas nostalgia.